Veronica Burton dribbles the ball. The freshman guard hit a huge half-court shot to cut into the Illinois lead at the end of the third quarter. Even down by 11 points to in-state rival Illinois in the final seconds of the third quarter, freshman guard Veronica Burton knew no one on the team had given up. So she gave Northwestern another reason to believe when she stole the ball off an inbounds pass, took a few steps and then fired a shot from the half-court logo before the horn sounded. The desperation buzzer-beater proved a much-needed catalyst for a Wildcats (13-7, 6-3 Big Ten) team missing two key starters due to injuries. It sparked an 18-0 NU run marked by stifling defense and aggressive finishing close to the basket. The Cats, who trailed for over 30 minutes of the matchup, dominated in the game’s final act, holding the Illini (9-11, 1-8) to just 5 fourth-quarter points en route to a 64-56 win Sunday afternoon. The victory in Champaign, Ill. is the latest in a string of successes for NU, winners of four straight games against conference opponents. The Cats have performed under less than ideal conditions, as junior forward Abi Scheid missed the past two weeks with an undisclosed injury and Jordan Hamilton was a scratch for Sunday’s contest. After hitting 13 wins on the season, the team has already surpassed its win total from a year ago. 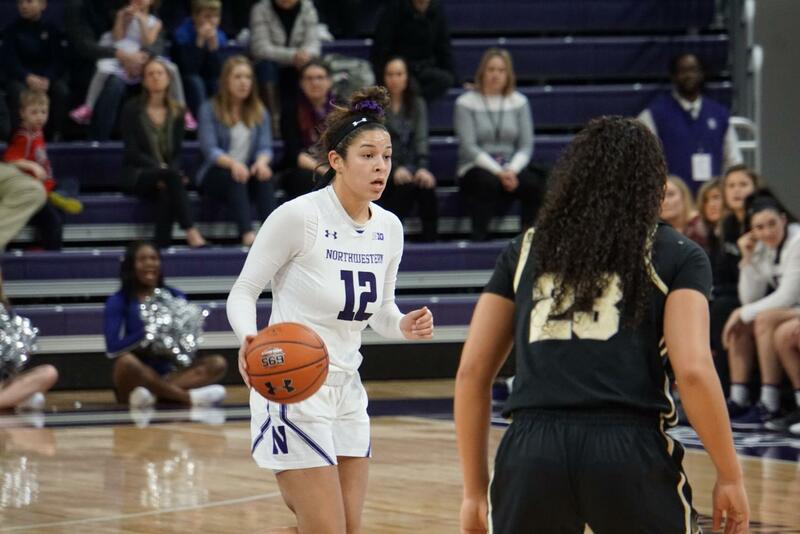 The winning streak has coincided with the insertion of junior forward Bryana Hopkins into the lineup, and against Illinois, she had one of the best games of her career. She recorded a double-double on 11 points and 10 boards. Senior forward Pallas Kunaiyi-Akpanah praised Hopkins’ performance in place of the usual NU starters. The Cats scored a mere 25 points in the first half of action and frequently settled for contested jumpers, while at the same time giving up high-percentage opportunities to Illinois. Part of the reason was a difficult shooting performance from sophomore guard Lindsey Pulliam, who led the Cats with 14 points but was 5-for-21 from the field. At halftime, Kunaiyi-Akpanah said the team evaluated its mistakes and identified ways to get better looks than the Fighting Illini. Once NU’s shots started falling in the second half, she said it gave the team motivation on the defensive end of the floor. Although the Cats’ defensive performance was a match highlight, their weak shooting from the charity stripe — the team shot 12-for-24 in their trips to the line — is undoubtedly an area for improvement. Coach Joe McKeown said while he liked the team’s effort in drawing fouls, converting those opportunities would be a focus in practice for the upcoming week.